Students in Mr. VanSant's 7th-grade English class have been reading Persepolis, an autobiographical graphic novel depicting the life of a girl growing up in Iran during the Islamic Revolution. 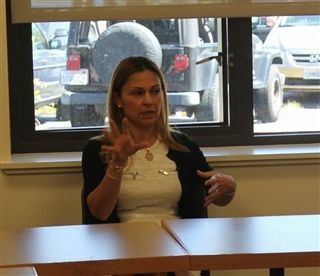 Last week, Pacific Ridge parent Elham Tabatabaii visited the class to share her experiences growing up in Iran during the Iran-Iraq war and offer a personal perspective on students' questions about the country's political and cultural landscape during that time. When the class finishes the book, students will embark on a project sharing their own family history in the form of a comic strip.